DancePro Portfolio Shoots are a great way to capture and share your talent and passion for dance. Set amongst some of Perth's most beautiful outdoor locations, these incredibly affordable photography sessions are now available to all dancers. Whether you are a professional dancer or a student in training, you can now have your talent and skills showcased in beautiful images. CLICK HERE TO BOOK YOUR DANCEPRO PORTFOLIO SHOOT! - All dancers under the age of 18 must have a parent/guardian over the age of 18 present at all times. The chaperone may be required to hold a light or reflector. 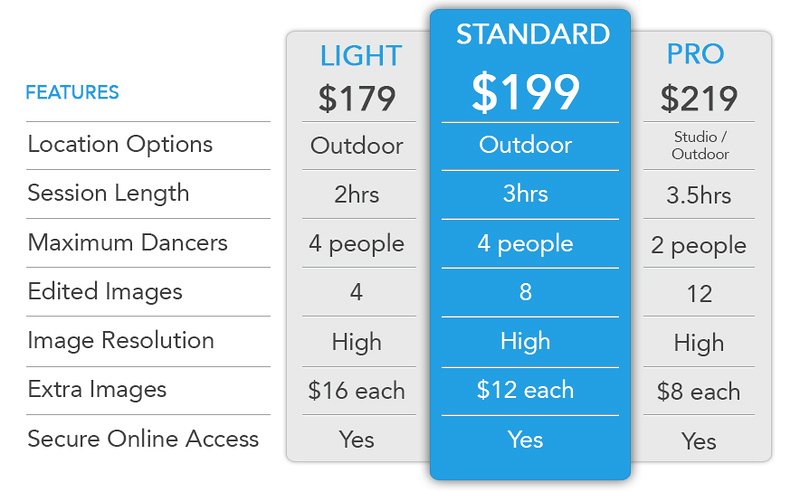 - Outdoor locations will be chosen based on the genre of dance images you request and the dancer's location. - The Pro package has the option to choose a studio shoot. The studio is located in Bayswater. - If you require a longer session, please get in contact with me. - Dancers may be grouped with other dancers during their shoot to improve efficiency. If you would like to book a shoot with a friend, please let me know as discounts apply. - All images are beautifully and carefully edited and retouched using professional quality software to achieve stunning results. Images will be provided via password protected galleries. You can download your images in high-resolution and are free to edit, crop and upload your images to social media. - There may be extra images not included in your package that you will have the option to purchase. - Payment must be made in full to secure your booking. - Cancellations made more than 48hrs before shoot appointment will receive a 50% refund. Cancellations made less than 48hrs before shoot appointment will not receive a refund. Rescheduling may be possible and is at the discretion of DancePro Photography. - Rescheduling may be necessary in the event of unexpected wet and stormy weather. - Images may be used for publicity and promotional purposes for DancePro Photography. - You will be sent an information package after you have placed your booking.